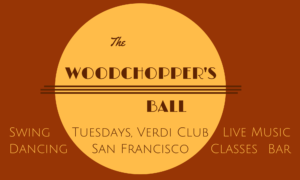 The Woodchopper’s Ball, San Francisco’s swing hot spot, is a weekly Tuesday night swing dance event held at the historic Verdi Club in San Francisco’s Mission district. Named after the classic 1939 swing tune by the Woody Herman Orchestra (and their biggest hit! ), the Woodchopper’s Ball features monthly classes, a full bar (21+ only), and a dance party with a drop-in lesson and the largest variety of live swing dance music in town! Brought to you by Hep Jen and Ken Watanabe, long-time regular instructors and organizers at San Francisco’s Lindy in the Park. Live Music Dance Party: 9:00-11:30pm, with a different band each week! Only $10, all ages! Drop-In Basic Swing Dance Lesson: 9:00-9:15pm, included with Dance Party admission! Perfect for complete beginners (no partner or experience required)! Monthly Swing Dance Classes: Intermediate Lindy Hop and Beginning Balboa 7:00-8:00pm; Beginning Lindy Hop and Intermediate Balboa 8:00-9:00pm. Fun, friendly, and featuring some of San Francisco’s most experienced swing dance instructors! Enrollment includes admission to the Dance Parties! Full Bar & Lounge: 7:30pm-closing (21+ only). Enjoy a classic cocktail in the swanky, vintage bar and lounge! 2,500-sq-ft Dance Floor: Large, beautiful, hardwood dance floor with plenty of room to swing out!